2014 has been quite a year for Bradford Stauffer in terms of honors received for his service to his fellow military veterans and his community. Earlier this year, Stauffer, who graduated from Holton High School in 1964, was named the HHS Outstanding Alumnus of the Year. 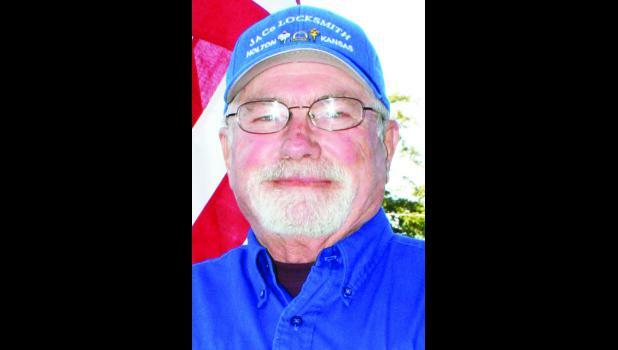 More recently, he was selected to serve as grand marshal of this year’s Veterans Day Parade on Holton’s Town Square, set for 1 p.m. on Tuesday. On top of that, Stauffer has been named among the 10th round of inductees in the Holton/Jackson County Chamber of Commerce Hall of Fame. He’ll join Bill and Debra Brown, Mike Ford and the late Jim Potter in being honored at this coming February’s Hall of Fame banquet. After his graduation from HHS, Stauffer, who grew up west of Holton, signed on with the Kansas Army National Guard in December 1964, completing his basic training and advanced infantry training at Fort Polk in Louisiana. He then returned to the Holton armory before his Guard unit was activated in April 1968. In November of that same year, Stauffer was levied to the Tay Ninh Province 25th Infantry Division in Vietnam, and he arrived there in December, serving as an infantryman and squad leader. In June 1969, Stauffer was injured on a “search-and-destroy” mission when a rocket-propelled grenade hit a target near him and shrapnel from the RPG got embedded in his head. After recuperating for “about a month” and receiving a Purple Heart, he transferred to Nui Ba Dinh, where he supervised an 81mm mortar section, a deuce mortar section and a searchlight section before his unit was sent home. He boasts that he “got home in time for Thanksgiving dinner,” and his unit was deactivated that December. “I got out for a year and a half, and then I got back in,” Stauffer said. Stauffer served with the National Guard and the Army for a total of 38 years, 28 of those years on active duty. For 20 years, he was in charge of the Holton armory, from 1976 to 1996, when he accepted a school manager’s position for the Guard in Topeka. Later, Stauffer attended the U.S. Army Sergeants Major Academy in Texas and was promoted to sergeant major, serving as operations sergeant major of the 130th Field Artillery Brigade until he retired in 2004. But his retirement was not by any stretch of the imagination the end of his service to his fellow men and women in uniform. “I'm an advocate for veterans’ rights, because sometimes, trying to get through the VA (Veterans Administration) system, it just seems like there are so many veterans coming home who have never been briefed on or understand what they may have coming to them,” he said. Stauffer’s job today, he said, involves making sure that military veterans of all branches of the Armed Forces find out about, and get the proper access to, their benefits. That extends to families of veterans, and he is ready to answer any of their questions and point them in the right direction. Stauffer also has testified before the Kansas Legislature on matters relating to services for veterans, and he serves on the Kansas Veterans Claims Assistance Program Board. He’s also involved with the Kansas Commission on Veterans Affairs and promotes the commission’s Web site (kcva.ks.gov/kanvet) as an essential resource for veterans. “It’s a one-stop shop for them to see if they can get jobs and benefits,” he said. On the local level, Stauffer has been active with Holton's Veterans of Foreign Wars Post 1367, serving as post commander for several years and district commander in 2008 and 2009. He currently serves as post quartermaster and service officer, and he assisted in getting Purple Heart designations for Holton and Jackson County. Stauffer has also owned and operated Jackson County Locksmith since 2007, but in reality taking care of locks has been something he’s done since his military days, when he did it part-time. He sold his locksmithing business to Sheryl Hansford in 1996, when he moved to Topeka, and then bought it back from her 10 years later. Stauffer and his wife, Judy, live west of Holton, and they have plenty of time to devote to their three children, five grandchildren and three great-grandchildren. But it’s his service to his fellow veterans that strikes the greatest chord with him, and the Hall of Fame honor, he said, reflects just doing what comes naturally.